This chapter expands upon the definition of a simulation with two categories: experiential and symbolic. It discusses the interactive, experiential trend in digital teaching and learning, and the educational merits of simulations. This chapter tries to locate digital simulation’s position in these trends. In doing so, it explores the educational merits of digital simulation, discusses the learning mode of digital simulation, and outlines what digital simulation conveys to deliver educational contents. In addition, it will look at the characteristics and functions of digital simulation. 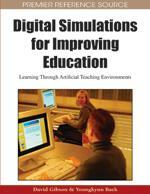 Mainly this chapter focuses on how simulation is used for teaching and learning. It highlights simulation’s features to be effective for teaching and learning. It also introduces challenges to simulation to overcome its disadvantages. Several examples of digital simulation in teaching and learning are explored: They are “Max Trax, Strategy CoPilot, Virtual School, simSchool, simClass, Krucible”, and “Starry Night”. Lastly, this chapter seeks to forecast the future of teaching and learning with a focus on information technology and simulation by finding simulation’s role and contribution in learning context. This section summarizes interactive and experiential trends in teaching and learning. It tries to locate digital simulation’s position in these trends. In doing so, it explores the educational merits of digital simulation, discusses the learning mode of digital simulation, and outlines what digital simulation conveys to deliver educational contents. New ways of teaching and learning are arising, made possible by a variety of new technologies, online resources, and educational delivery methods. These new approaches induce teachers and students to perform different academic roles, share workloads in new ways, and acquire and utilize new skills and knowledge (Hovenga & Bricknell, 2004). The changes began to appear with the enormous increase in and effectiveness of information technology and computer use, but there is an even more significant change emerging now: digital games and simulations, artificial intelligence and virtual reality with immersive interactive technology. These new tools require teachers to devise new teaching methods for today’s students, who have grown up with such technologies. Students are comfortable being ubiquitously connected, wired “24/7” and multi-tasking, and accustomed to using technology as and when they wish for their daily lives, including learning. This trend toward self-directed, highly interactive, rich-media experiential environments, evident in sites like YouTube, online news media sites, and iTunes, challenges educators to examine the power of interactive digital environments. MacDonald (2008) notes that today’s students want, need, and expect the flexibility, convenience, interactivity, and animation afforded by the use of technology in their courses and programs. The trend toward increased interactivity and personal experience is expected to continue into the future and to become more embedded in work and everyday life. For example, Dwerryhouse (2001) asserts that future learning is work-related learning, which involves learning embedded within the workday to promote higher levels of productivity. Self-directed learning, which is the most personalized kind of learning, is more prevalent nowadays in informal learning settings (e.g. museums and exhibits) than in the formal educational system, but with technology, could become embedded in the student’s “workday” to help them achieve higher levels of productivity. Experiential learning, a hallmark of the kind of learning that is embedded in games and simulations, is assumed to be the ideal learning method for self-directed learning. Besides the advantages gained when learners take responsibility for their own improvement and advancement, experiential learning is expected to increase and deepen understanding of a subject, and to increase self-efficacy and motivation. Experiential learning fosters in-depth information processing and elaboration, as it builds up learning skills and leads to higher motivation for learning initiated by a learner’s direct involvement. According to Kolb (1984), experiential learning consists of four elements: concrete experience, observation and reflection, the formation of abstract concepts, and testing in new situations. It is suggested that the learning process begin with carrying out a particular action and then seeing the effect of the action in this situation. The second step is to understand these effects in the particular instance enough to understand what follows if the same action is taken in similar situations. The third step is to understand the general principle under which the particular instance falls. The last step is to transfer what is obtained into real life. Because experiential learning is often equated with high levels of learner activity, simulation-based learning is thought to be ideal especially for those who may be less motivated to learn with traditional materials. The contextual content of simulations allows the learner to “learn by doing” (Kluge, 2007). With the advent of the computer age, digital simulation provides effective virtual learning experiences for learners in many fields, such as medicine, police training, engineering, physics, the military and aviation. Prensky (2001) notes that learning by doing is central to game and simulation based learning, because it turns out that “doing” is something that computer simulations are especially good at; they allow us to interact with them. Of course, there are many ways of learning by doing; drill and practice is one form of doing; exploring, discovery, and problem solving are other forms. What is essential is active participation by the learner. We thus expect to observe, research, measure and report on the impacts of active participation and learning by doing—interaction and experience—in simulation-based learning.